Shrimp in Pernod is now my favorite way to eat this crustation these days! My dad makes this once and a while; it’s his specialty. I found this recipe on my previous Vanilla Bean blog site, “Classic Vanilla” 😉 I thought, “oh, yeah…this was really good!” What is Pernod, you ask? Pernod is a french liqueur that has a light black licorice flavor – Lighter tasting than Sambuca.I personally don’t like black licorice flavor at all! In this recipe however, it tastes great. Maybe its the Pernod or the cooking process – don’t know. So if you’re not a fan of the flavor, give this a chance anyway. Although, it doesn’t have to be served as an appetizer. Just serve over some plain white or wild rice with a salad and transform it into a main course. A few people that I know tried it and loved it. It is a real crowd pleaser. Must be cooked in batches, 6 to 8 shrimp at a time. 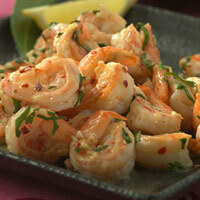 -Approximately 24 medium sized raw shrimp. Drizzle approx. 1 tsp of olive oil into a medium sized, non-stick frying pan. Remove contents of the pan into a serving dish. Repeat same method with remaining shrimp.